Cheesy Baked Taquitos - the easiest baked taquitos ever, loaded with cheese. Takes 15 mins active time to make this amazing recipe. Now that we have the final two teams for Super Bowl 2017, I am sure every sport fan in the country is waiting eagerly for the big game on February 5. I am sure many of you are planning a Super Bowl party to watch the game together with friends and family. If you are still trying to figure out what to make for the Big Game, I have the perfect recipe just for you. 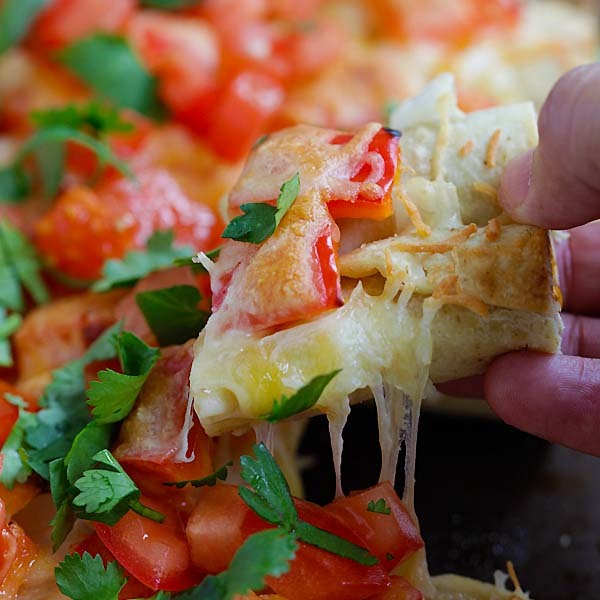 This Cheesy Baked Taquitos is a crowd pleaser; imagine cheese and chicken Taquitos layered with diced onion and red bell pepper, and topped with loads of cheese. 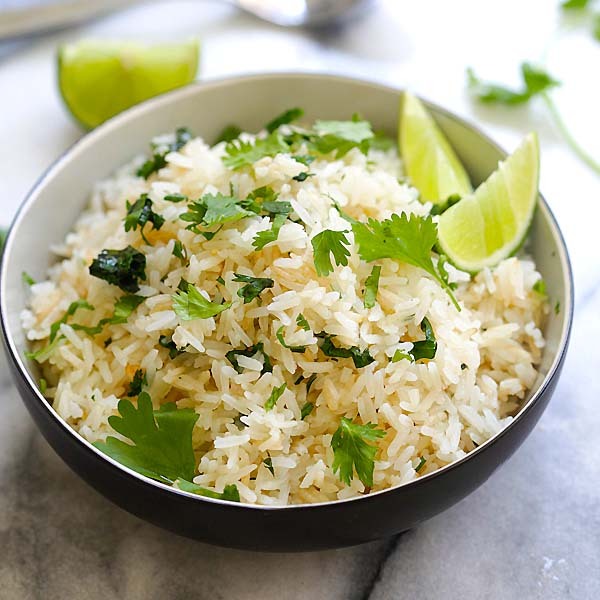 Garnish with diced fresh tomato and cilantro and you have the best and most delicious finger food for the entire family. What’s more, this recipe takes a painless 15 minutes to prep and 12 minutes in the oven. Thanks to José Olé Snacks. It’s easy to serve real food and save time with José Olé Taquitos and you don’t have to cook all day on Super Bowl Sunday. 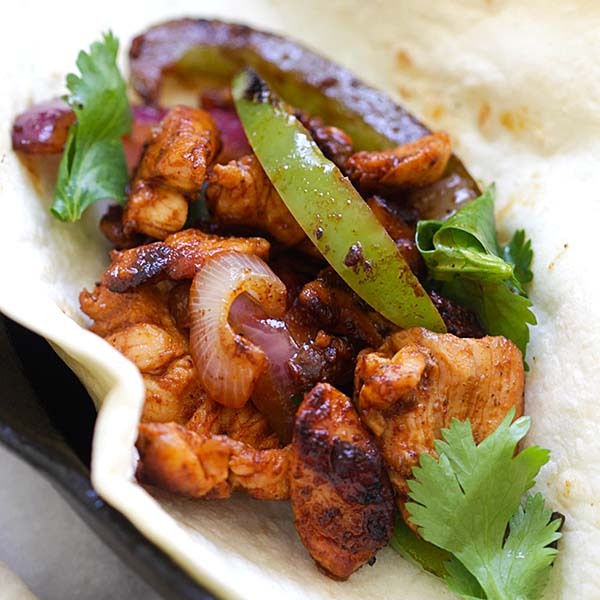 José Olé allows you to preserve your family’s Game Day traditions without sacrificing flavors! José Olé Taquitos are made with real chicken and cheese, I chose the ones wrapped with flour tortillas. They can be found easily at the frozen section of any supermarket. Half an hour before the game, you can take it out of your fridge, cut each taquitos (there are 15 of them in each box) into 3 pieces and arrange them on a baking sheet. Dice your onion, bell pepper and tomato and that’s pretty much all the work. By the time the game starts, you would have these cheesy baked taquitos ready. This is a sponsored conversation written by me on behalf of Jo Ole . The opinions and text are all mine. Cheesy Baked Taquitos – the easiest baked taquitos ever, loaded with cheese. 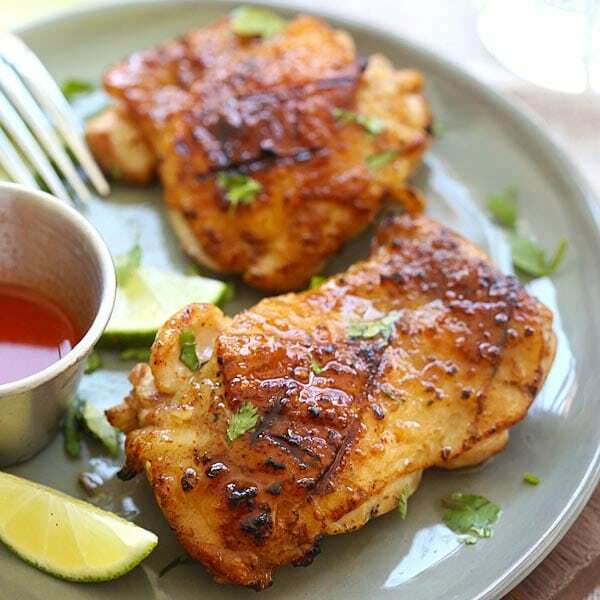 Takes 15 mins active time to make this amazing recipe. Cut each José Olé Taquitos Chicken into 3 strips. Arrange on a baking sheet. Top with diced onion, bell pepper and cheese evenly. Bake for 12 minutes or until the cheese melts completely. Remove from the oven and top with tomatoes and cilantro. Serve immediately. All photos and recipes on Rasa Malaysia are copyright protected. Please do not use the photos and recipes without prior written permission. If you wish to republish this recipe, please rewrite the recipe in your own words instead of copy and paste and link back to //rasamalaysia.com/cheesy-baked-taquitos/. Thank you very much! Wow! This looks like a very simple way to cook taquitos as all the ingredients mentioned are always easily available in every kitchen! Thanks for sharing this recipe! Thanks for your comment, yes very easy to make these cheesy baked taquitos. you can visit to website.. I want this now. Looks yummy! Could’t stop looking at the taquitos pictures in the blog so I ran to the grocery store and made them! They are the best dinner! The children loved it and they are so easy to make! Thanks Antony, this cheesy baked taquitos are great for Super Bowl today! I want this now. Looks yummy!!!!! These look so good! I love how easy they are to make – and, of course, that they are healthy! Thnks you for sharing this information. Wow this looks so yummy and delicious. Thank you for the Recipe.